These potato skins make a really special and nutritious snack to enjoy with drinks. Preheat the oven to 400ºF. Scrub the potatoes and dry them with paper towel. Thread them onto metal skewers – this helps them to cook more quickly. Brush the skin of the potatoes with 1 tbsp of the oil, then sprinkle with a little salt. Arrange on a baking tray and bake for 1–11?4 hours or until tender. Remove the potatoes from the skewers and cut them in half lengthways. Scoop out the flesh, leaving a layer of potato next to the skin about 1 cm thick. (Use the scooped-out flesh for fish cakes or mash to make a savory pie topping.) Cut each piece in half lengthways again, and place, flesh-side up, on a large, clean baking tray. Melt the margarine with the remaining oil and season with salt and pepper to taste. Lightly brush this mixture over the flesh side of the potato skins. Return to the oven and bake for a further 12–15 minutes or until golden and crisp. Meanwhile, cut the smoked salmon into thin strips and sprinkle with the lemon juice. Mix together the yogurt, capers and chopped dill in a bowl, then stir in the salmon. Allow the potato skins to cool for 1–2 minutes, then top each with a little of the salmon and yogurt mixture. 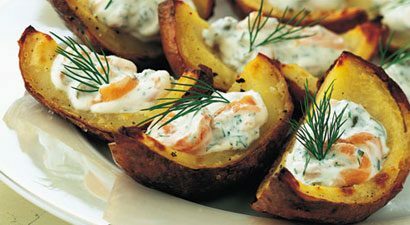 Garnish each with a small sprig of dill, then serve while the potato skins are still warm. For a salmon and tomato topping, mix together 1 can salmon (about 210 g), well drained, 12 ounces chopped ripe tomatoes, 1?2 chopped cucumber, 6 sliced spring onions and 12 chopped black olives. Whisk 2 tbsp extra virgin olive oil with 2 tsp red wine vinegar, 1 tsp Dijon mustard and salt and pepper to taste. Add to the salmon mixture and mix well. For a chunky guacamole topping, peel and chop 2 ripe avocados, then mix with 1?4 cup (60 ml) lime juice, 1?3 cup (85 g) Greek-style yogurt, 4 finely chopped ripe tomatoes, 1 deseeded and finely chopped fresh red chile or a dash of Tabasco and salt and pepper to taste. Instead of making potato skins, bake 12 small potatoes for about 50 minutes or until tender. Halve the potatoes and scoop out most of the flesh, then fill with the smoked salmon and yogurt mixture or one of the other toppings. Baking potatoes in their skins helps to retain their vitamins and minerals – many nutrients are found just beneath the skin. Eating the skins also boosts the intake of dietary fiber. Salmon is an oily fish and a rich source of essential omega-3 fatty acids, a type of polyunsaturated fat that is thought to help protect against heart disease. The process of smoking the fish to make smoked salmon doesn’t destroy the beneficial oils.